This past Labor Day weekend, our son outdid himself in proving his culinary versatility. You see, an ordinary grill wasn’t good enough, so the kid bought himself a smoker a few months ago. He is carrying on a human male tradition that began with the first cave dwellers—burning meat over an open fire. He cooks slabs of brisket and racks of ribs, but with the smoke instead of the flames. After smoking the slabs of meat and the ribs,he wraps them in butcher paper and places them within a large metal box that could pass for a floor safe. Inside this warmer thingy, the meats reabsorb the juices lost during the smoking process. The result is so delicious it is indescribable and quite possibly sinful. I’m sure we all committed the deadly sin of gluttony many times over. I’m too embarrassed to go to Confession and admit it. 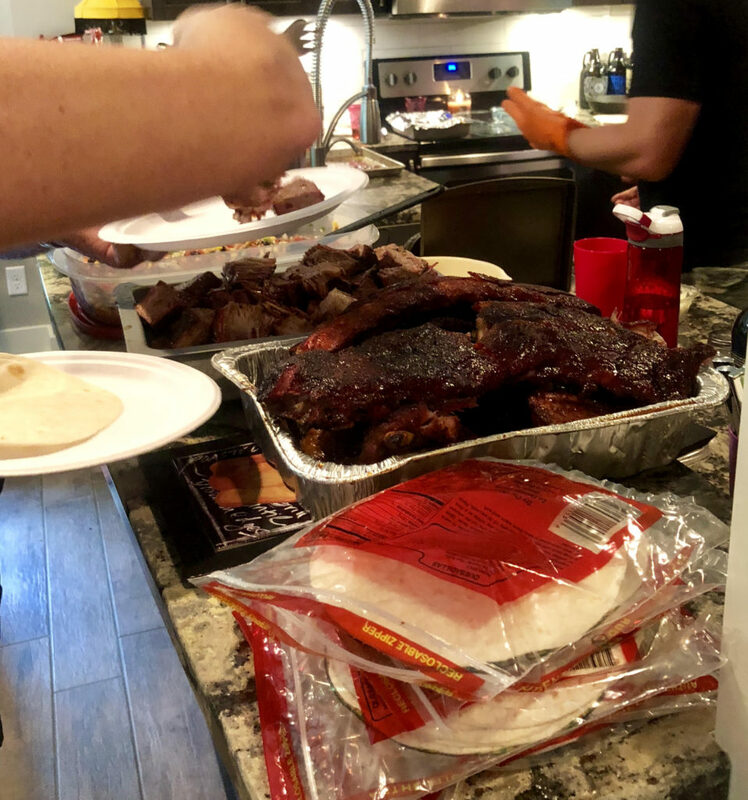 So, in addition to the chunks of smoked meats, the friends and family—including MG and me—supplied an extravagant amount of side dishes, desserts, and both alcoholic and non-alcoholic beverages. 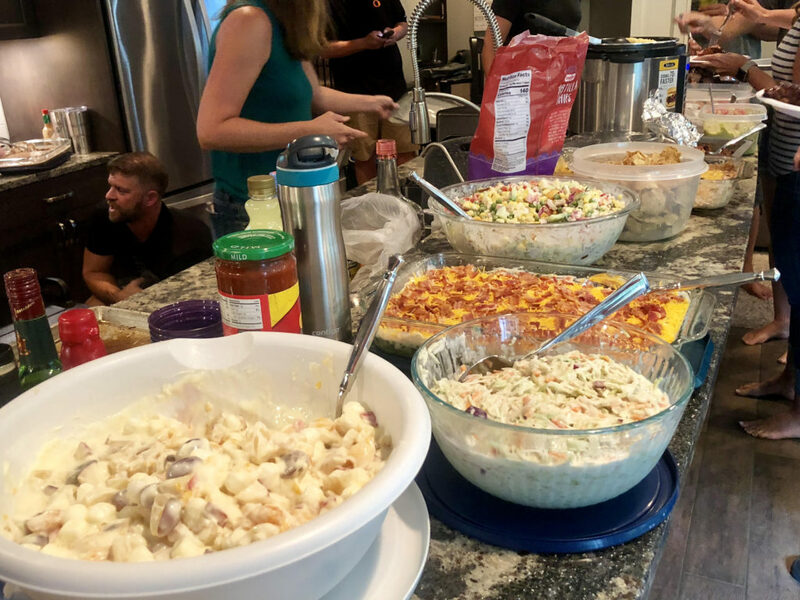 There were four huge salads (Ambrosia, Cole Slaw, Seven Layer Salad, and Southwest Corn Salad), a pan of Old Settlers’ Beans, a huge crockpot of cheesy potatoes, two dozen corn muffins, two apple pies, a peach cobbler (made with fresh peaches), a pan of chocolate and peanut butter frosted brownies, Oreos in whipped cream, and an assortment of cookies. The wine and cocktails flowed freely, as did the iced tea. There was something for everyone. After consuming a nearly endless parade of food, we were barely able to move our bodies. Our hands remained operable, so we played a few card games. The guys got a Euchre tournament going. That went on for hours. 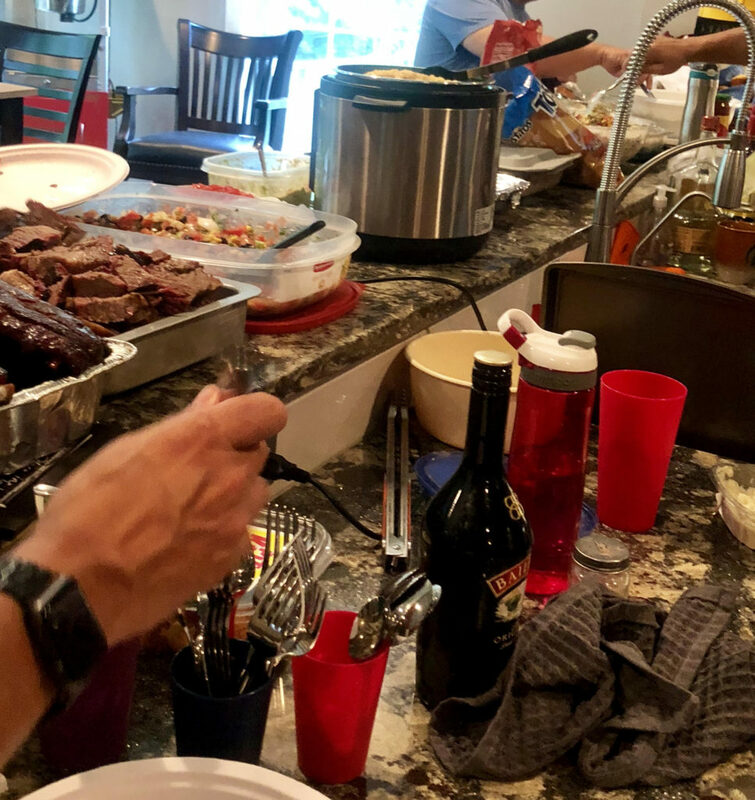 I have it on good authority (my son) that he and his friends (who stayed up much later than his in-laws, MG, and me) spent the next day in their pajamas recovering from the ‘food-apalooza.” MG and I also suffered the agony of overindulgence. As it turned out, the fun greeting card I chose for our birthday boy was extremely apt. It’s in the video below. Take a peek.